The 40 x 46mm is a low-velocity round for grenade launchers in service with the Canadian Armed Forces and its allies. The 40 × 46mm is used in hand-held weapons such as the M79, M203, the M320 grenade launcher, and the multi-shot M32 MGL or Zakłady Mechaniczne “Tarnów” SA RPG-40. 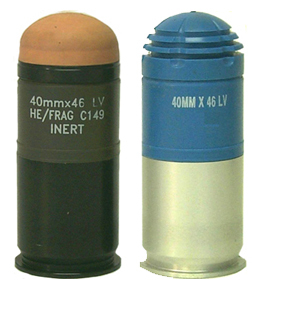 The 40 x 46 mm High Explosive Fragmentation (HE/FRAG) C149 grenade is a low-velocity grenade that is fired from the M79 grenade rifle and the M203 grenade launcher. Using components supplied by Rheinemetall (formerly: ARGES/Austria), the C149 grenade is assembled under licence by GD-OTS Canada to meet Canadian requirements. Upon target impact, the grenade detonates and releases 1,000 2-mm steel balls at high velocity. It also contains a self-destruct fuze, which is armed at 11 to 19 m from the muzzle, with self destruct occurring 10 seconds thereafter, if no target is engaged. • Muzzle Velocity: 78 m/s. • Maximum Range: 400 m.
The 40 x 46 mm Target Practice (TP) Marking grenade matches the C149 HE/FRAG grenade when fired from the M79 grenade rifle or the M203 grenade launcher. Using components supplied by Rheinemetall (formerly: ARGES/Austria), the TP grenade is assembled under licence by GD-OTS Canada to meet Canadian requirements. Upon target impact, a non-toxic orange smoke cloud marks the point of impact. A tracer that burns for approximately 4 s can be added to the grenade. Left: M203 Grenade Launcher being used by Canadian Soldier. Right: M79 Grenade Rifle being loaded.